Ok, first off, I should state that Warmachine and Iron Kingdoms are not Steampunk. It seems that they don’t like to be labeled as Steampunk, but they have a term they’d rather people used: Full-Metal Fantasy. So yes, the Wargame and RPG are set in a fantasy world of elves, dwarves and gobbos, swords and magic, and gunpowder and steam engines. 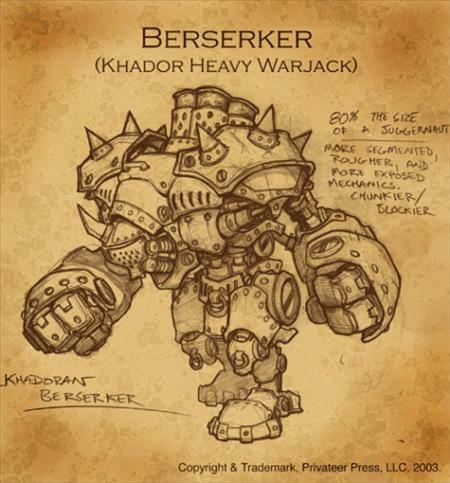 Oh – and most importantly, giant steam-powered golems (steamjacks/warjacks). So as you can see, there’s still some visual treats for the Steampunk fans amongst us; giant steampowered robots are generally good, no matter where you find them. chuckles Iron Kingdoms is the RPG, and seems to be based on the D20 ruleset, whereas the Warmachine game is a miniature wargame all about those warjacks I just mentioned. Many thanks to Mr Duppi (who declares it one of the best games he has ever played), Mr W. Nomad and Mr Jonno for finding the steam here!